This Taylor Precision 5983N glass, candy thermometer has stainless steel construction, dual range, and a clip on the back. It has a temperature range from 100 degrees Fahrenheit to 400 degrees Fahrenheit. We use this thermometer for candy making and it is a solid piece of kitchen equipment. Sturdy and the numbers are easy enough to see and read. Works well, the 12” size really helps for larger pots and larger batches of candy making. I use this while I’m making my caramels and toffees, and it’s worked perfectly for me so far! I used this for a French Silk pie I recently made and I was able to measure the temperature without the guess work. It’s easy to use and easy to clean. With an adjustable latch, you can fit this thermometer to almost any post and it will work like a charm. This is really great for frying, to make sure you maintain the right temperature in your oil without getting too hot or cool. I haven't made candy with this, but I'm sure it is great. I make alot of caramel and this is the best and the most durable candy thermometer I have. I would recommend it to anyone who makes and candy or caramel. These thermometers are perfect for anyone working with sugar or deep-frying. The 12" length means there's plenty of space between you and the dangerously hot contents of the pot and the readings are consistent, accurate, and legible. The Taylor 12" Classic Candy and Deep Fry Thermometer is exceptional. I was expecting a cheaply made one because of the price but, that isn't what I received. Highly recommended! This is one of the most true temp thermometers I have have found. When preparing sugar for candy making, temperature must be exact of the product will fail. This candy thermometer helps me maintain my temperatures and ensure I have an evenly heated product every time. It is vital to know the temperature of your oil when frying and your sugar when making candy. This does the job as well as you could ask! Taylor thermometer are the best once's I've ever had. You can find them in every store around the nation, but for this candy thermometer I found the best deal here on Webstaurantstore.com. It works great and its made with high quality parts. This is a great old school classic thermometer. I use it mostly for baking and candy making. A candy thermometer is a must have when making Italian Meringue and this one works great for that. Great thermometer withe reliable temperature display. I use it when making meringue frosting and caramel. Love that you can attach it to your pot as well. Perfect little kitchen sidekick. I use it for making caramel and sauces. Also I use it for frying donuts and what not. Many many uses and it is very accurate! There is no mistaking on the read of the temperature with this essential kitchen tool. I make a lot of candy apples and this is my go to tool for accurate temps. Very happy with the Taylor Thermometer. Great for accurate monitoring of temperature for deep frying or candy. Clips on sturdy, and is easy to read. I wish it came in another size option- a shorter length for smaller projects in shallower pots. Taylor is an old kitchen standby in thermometers and this is another of their timelessly good products. Works as intended with clear markings and easy to clean. 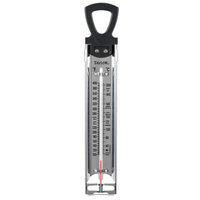 I purchased two of these candy thermometers - one for making strawberry jam, and the other for making cold process soap. It is durable, sturdy, and has a convenient clip on the back. This makes making soap so much easier and I would highly recommend them. I can tell these will last a long time, unlike another I purchased at a different store which is made of plastic and water leaked into where the thermometer is. These are also very easy to read the temperature! Very sturdy and a great design. I use it for making donuts and it's always accurate. The price is inexpensive and it's a great product. Sturdy design, A click that WON'T BREAK OFF, fast response time, and dishwasher safe. If you deep fry you need this. unlike cheaper versions the clip on the back keeps it in place, won't shift or fall off. Nice construction and great price! I love to make hard candy suckers and clipping the thermometer to the pan makes it easy to read. Non staining and easy cleanup is also a plus! Worked great for me. It seems to adjust to the temperature of the oil rapidly and doesn't have any issues at higher temperatures. Also a huge perk is that it doesn't stain very easily! Was able to turn my 32 quart Rondo into a deep fryer with this thermo. Easy to clean and was accurate, great value for the kitchen. This is the best candy thermometer on the market, I use it to make my Italian meringue buttercream. I love that it clips onto the pot so it doesn't touch the sides or bottom of the pot so you get an accurate reading. Very well made and more importantly, very accurate to use for frying and candymaking--when accuracy makes all the difference in the world. Nice size, easy to clean up. This thermometer works very well for frying. As you can see in the pictures, it has nice clear font for temperatures in addition to labels for different desired outcomes. We've used this for frying, but it also works for ensuring water is the correct temperature for yeast. It's very versatile, useful, sturdy, and seems built to last. An awesome tool to have. When making caramel or poaching anything, a candy thermometer helps a lot. I even use it when I deep fry anything at home. It's fun to watch the temperature go up and down as I keep adding more food to the oil. Durable and accurate - you can ask for very little else from a candy thermometer, and this delivers on both counts. One tiny drawback is that the clip on the back is a little bit flimsy. Nothing to worry about unless you're attaching it to a thick-walled pan with any regularity. I love these candy thermometers! They last a very long time and are true to temperature- they are a kitchen necessity and I highly recommend! The kitchen staff loves this thermometer. It is very accurate and allows us to get items to the exact heat without burning or ruining them. I don't want to admit how many digital thermometers we have gone through. It seems that when you need them the most, the battery is always dead and you never have a back up. This is the best solution, simple is very often the best! They are built to last, very strong and robust design. I use it to measure the temperature of the oil in my of my fryers. Reliable. this candy thermometer proved to be invaluable. In frying both the french fries and funnel cakes we were able to better control the temperature of the oil. Easy to read and use. This is my very favorite candy thermomter. Just latch on the side of the pan and come back to check for the proper temp. I have two of these, but the temp varies by a couple of degrees, so you may need to adjust the scre on the back to make it accurate, or allow for this. Cleans up easily. I use this for candy in my bakery. The temperature is very accurate. It's a nice and long. Cleaning this is easy and comes out perfect. This arrived today, and I've already used it. I checked the temp with another thermometer and it was right on. I should have gotte one years ago. Great product. This thermometer is great, way better than the typical "candy thermometer" which you get for cheap. It has a sturdy clip (see picture) and its "holder" allows it to rest at the bottom of your frying vessel. I should have bought one years ago. This is a very large candy and deep fry thermometer but it is super accurate! Great for deep frying in a pot where its hard to judge temperature!! Nothing fancy. Good, sturdy craftsmanship. I haven't had a chance to use it yet, but I know when I do, it will definitely do the job. Works awesome! Easy to read and easy to use. it has a clip in the back so you can stable it on to the pot.